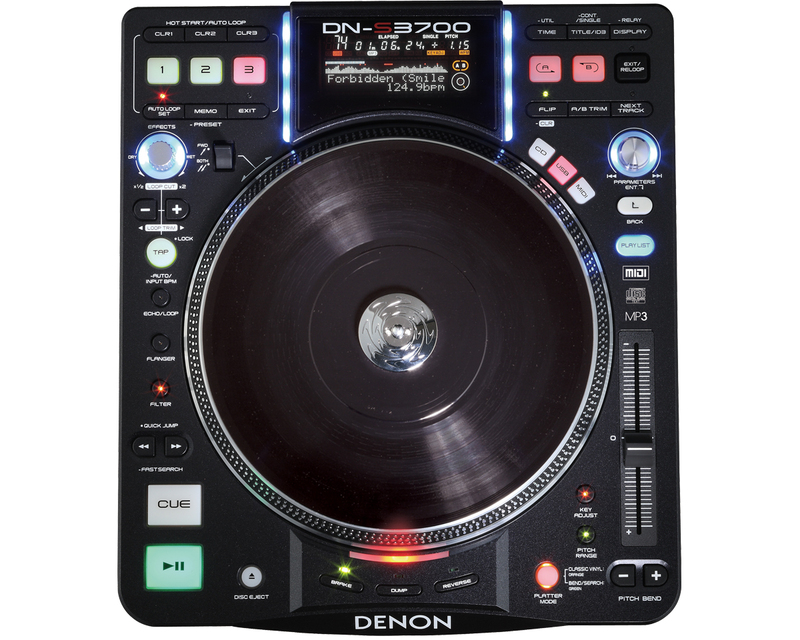 DN-S3700, Tabletop DJ player from Denon DJ. 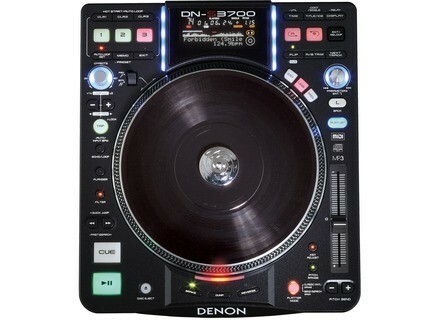 JimboSpins's review"Nice effects built into it"
The Denon DJ DN-S3700 has a 9 inch platter, and it feels very much like some of the vinyl platters that I have used over the years. When I first purchased this table top CD/MP3 player I was not sure if I would like it do to being used to working with only vinyl for so many years. I knew that working with MP3’s would make more sense and it would be a less load to have to carry but I wanted to still feel like I was working with vinyl. The Denon DNS3700 didn’t make me feel like I was on a vinyl turntable but it still feels pretty close. Using this table top platter is pretty simple, even if it is your first time or if you are coming from another similar style unit then you will have no problems adjusting to it because they are all pretty much the same. It has a high torque direct drive motor that pushes the platter which feels like a vinyl record on a slip mat to some extent. The LCD Display is also pretty good because it gets bright in poor lit rooms and clubs so it is still easy to see what is going on. There are also some digital effects on the DN-S3700, some of the ones that I found myself using the most is sweep, stutter, echo, and flanger. There are a total of 5 built in effects that are all very good and 3 platter effects. This unit is also built very well; it does not seem to be made out of cheap materials and seems to be holding up great. It took me a while before I was fully comfortable with it but once I used it a lot it felt like second nature. I recommend this to someone who is just starting out with this style of turntables and wants a great quality one from the start. There are cheaper ones on the market though for beginners. - Which feature do you like the most / the least? Pros: the three hot starts, the auto loops, the beautiful looks, the plate that gives you the feeling that you're actually using a real vinyl record, etc. Cons: no RJ45 cables, no fader start cables... In short, the only thing you'll find inside the box is the product itself. I'd expect more considering the price. - Did you try any other models before buying it? Yes: SN-S 3500 (I didn't like the plate), CDJ 400 (no hot starts and no auto loops). - How would you rate its value for money? Good compared with competitor product. Based on your experience, would you buy this product again? Yes I would!!! Dj Krieger's review (This content has been automatically translated from French)" Excellent"
I have kept about 4 months before needing to separate myself against heart. - Key features come to hand very easily, but it takes a lot further to exploit to the maximum. I had returned twice to the bar where I mix, the others have not been able to use them, they décalaient the hand for them was hard. - Calibration to jog when you disconnect the vinyl mode is not very precise, but hey I did not care I always left with the turntable. Eyes closed, I wanted these plates since their release, I could have them and separate myself was a bursting heart, can mix CD with vinyl top is a treat when it's done. Now, I do not think resume, I account as soon as I have the opportunity to take me a pair of CDJ 900 whose price has fallen sharply, and then move on his little sister, the DNS-3900. lachosenet's review (This content has been automatically translated from French)" A good turntable but missing some options"
The first point is the lack of sharing of mp3 one deck to another, it's a shame. The second is the effects that are more of a gadget (only the filter is actually usable). And the last is how to change the number of time loops, it is not ergonomic and I sprawled a few times because of it during a mix. The value for money is very good nothing to say about it. Today it is better for sure, and I think the change soon (they retire fixed in my studio), but if it again, I would do this choice without any hesitation. obabind's review (This content has been automatically translated from French)" An estimated as platinum"
+ It is without hesitation the motorized tray that is special and charm of this board, I also diraais hybrid mode. It is almost unbeatable, the deck plays all formats and is compatible Midi. pvesco's review (This content has been automatically translated from French)" Reserves ...."
Utulisée a month, purchased nearly new. For me again this choice? No, I toured the entire range of Denon players. I sold off my two 3700, 650 Euros the pair and it was a relief to see them go because they are very dificiles to spare. djons971's review (This content has been automatically translated from French)" I do not let go too well"
I use it for two months. yes on the range I'm dj denon tester. platinum as a very innovative when the output of the prototype dn8000 I wonder. least harbor sd card away!! lol if anything. I consider the price for a very characterize the weight of platinum with mixing experience I will always make that choice. Fabrice V's review (This content has been automatically translated from French)" Excellent platinum"
Platinum with its excellent motorized tray-type MK2. We really feel the vinyl mix. Despite what some say, the start and cue buttons are nice and responsive. Access times are fast and excellent reading. The three effects (echo loop, flanger and filters) are nice and the effect of the dump and brake plate. The display is the essential and effective. The quality and finish are perfect and the hardware is robust. I recommend this deck as it is of high quality with value for money better than the competing brand which I believe has just done a better marketing. djgohan's review (This content has been automatically translated from French)" DN-S3700 Really not bad"
So huge convenience, no need to burn, nothing more reliable than the USB drive, never had a problem. By starting with the lightest, it's a Christmas tree (the LEDs of all colors). At the pitch accuracy is there, but still not the top, I know if it will ever happen, but hey nothing to do with the axis9 fortunately. The big downside is to accelerate the piece, by touching the edge of the plateau is sensitive as a TSB and not as a Technics, so do not have ended with the + - certe which is very precise, but the charm staple for those who are used MK2 turntables vinyl. Denon has take a step forward in proposing this model, therefore I advise them to remove these wholes gadjets effect, for this focus on a plateau heavier and even maybe a little bigger. This remains one of the best CD players in the market, well thought out, with one big negative: the acceleration and braking of the manual tray that has nothing to do with the MK2 Technics. Proper value for money compared to Pioneer. deejay63's review (This content has been automatically translated from French)" Excellent"
I use it in a club, bar, private parties for over a year. I tested before Denon DN-S1200, DN-s1000 and pioneer cdj 800, cdj850, cdj 2000. - Quality workmanship at the top, it's heavy, sturdy, and it does not do plastic unlike cdj 2000 and 900. - The overall reliability of the plate like all Denon turntables. Denon and Pioneer are the two brands of decks and the most reliable by far. The value for money is excellent, the price was almost as complete a turntable cdj 2000 a few gadgets and functions within the color screen.